It’s another year and another start to celebrating life at Clonlee and surely there is no better way that a bit of Scottish music from the favourite musician, Stuart, to celebrate Robbie Burns Night on 25 January. Jock, Little Ted and Old Shep were the hosts today and shared their shortbread, haggis and washed this down with some Iron Bru. Mary, from Scotland said it was a great pleasure to have so many residents and friends with her today to join in all the fun. She said her favourite song was ‘I belong to Scotland’. Highlight of the afternoon was Allen, who took time off work to come and play the bagpipes and entertain us with ‘I love a Lassie and Amazing Grace’ which sounded beautiful on the bagpipes. He said its always a pleasure playing to such an appreciative audience including Kathleen who was really excited and presented Allen with a gift to show everyone’s appreciation. 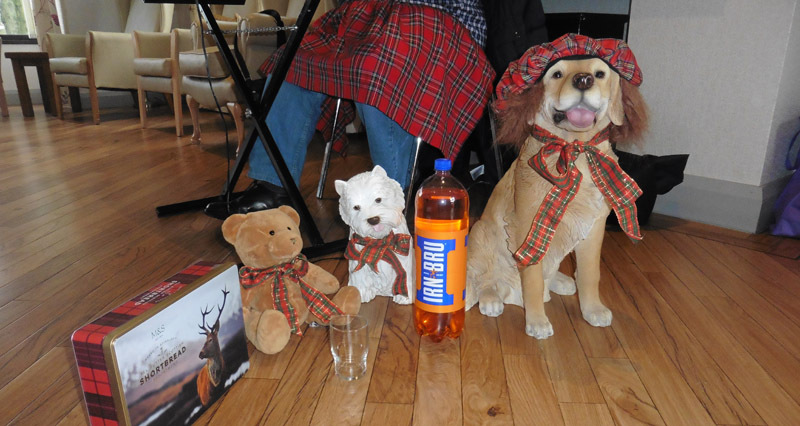 Stuart, finished the afternoon with ‘Auld Lang Syne ‘and everyone toasting the Laird…. Great Chieftain o’ the puddin-race.